The Ultimate Outsider is a fictional novel about ultimate by Skyd and Ultiworld contributor Alexander Rummelhart. It tells the story about a high school student discovering ultimate, dives into what it means to fall in love with the sport, and all of the fun hijinks that come with it. We sat down with Alex to chat about his new, ultimate-focused young adult novel (the first of its kind), to learn more about The Ultimate Outsider (now available on Amazon). Skyd: Thanks for taking the time to answer some questions about your book. Tell us about The Ultimate Outsider. What’s it about? Alex Rummelhart: It’s great to have the opportunity to talk about the book! The Ultimate Outsider is a novel about a young, athletic, but awkward, kid named TJ who just doesn’t feel like he belongs in any friend group or sport… until he finds ultimate. Overshadowed by his older brother in high school, TJ finally get his own chance to shine when he meets Eliza, one captain of the ultimate team, and the rest of the Pink TrollZ, the oddball group of players that make up the squad. He realizes that he fits into this humorous and unique world, but also that he has a great talent for the game. However, pressure from parents, school, and coaches of other sports force TJ to keep ultimate a secret and find a balance between real life and this ultimate world. The book follows the course of one season, combining both exciting game action and the hilarious and wacky exploits of being an ultimate player. Why did you decide to focus on the YA audience? YA fiction is growing in popularity, and it really seemed the best fit to capture ultimate from the perspective of a young person new to ultimate. The book has the feeling and experience of an ultimate season for any player, while also combining the themes- and humor- of growing up and trying to fit in, both concepts that every single person, regardless of age, can relate to. I hope the book is a great read for any age and that new youth players and veteran pro’s a like can enjoy it. What inspired you to write The Ultimate Outsider? I’ve always loved writing; I try to write something new every week. I’ve done a lot of writing in the ultimate world, especially in regards to reporting and covering tournaments, as well as trying to help younger players improve their game or team. I’ve also done a lot of coaching in ultimate. At the same time, I love fiction and love telling stories- making people feel excited about the thrill of action and making them laugh. The idea of writing an ultimate novel- the intersection of all these passions- had been in my head for a while, but I could just never find the right story in my head. Last spring I was driving in my car, listening to an ultimate podcast, and thinking about how I wasn’t the only one out there that would be interested in reading such a book, and that as a kid new to the game especially I would have loved it. Suddenly, ideas started flowing about a high school team and the characters, and it all clicked. Does Ultimate Outsider touch a lot on your experiences as an ultimate player? What of yourself did you put into this book? The Ultimate Outsider definitely draws on my ultimate experiences; in fact, I tried to write it to draw on global experiences as a player and lover of the game for everyone out there. The characters, the style, and the jokes of the team are all designed purposefully so that everyone can relate. I really wanted to capture the flavor and fun of ultimate. A lot of that is a combination of my own playing and coaching, of what I’ve seen and what I’ve heard from others, mashed up into a brand-new, totally fictional team. There is a lot of myself in the book, although I never had the opportunity to play in high school like TJ did, at least not formally. As I said, my observations about college, club, and professional ultimate drove a lot of the characters. The plot is largely made up to be exciting, funny, and to capture the themes as best as possible. 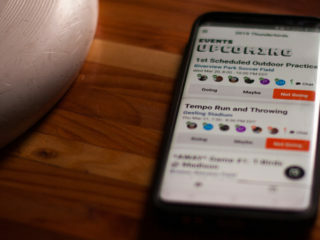 The themes- of not fitting in, struggling to find the sport and friend group for you- also definitely come from my life, but also the life of a lot of other people, and I pushed that concept of being an outsider to really try to show everyone how great ultimate is in its own secret world, a home for all of us. Favorite moments? That is tough because I love so many different parts of the book. 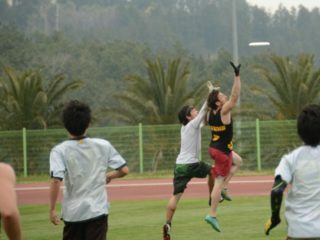 One of the ultimate captains is named Lee Foo and he’s a wacky leader; everything he does is hilarious- from trying to find the perfect nicknames for his players, to leading an awards ceremony that has nothing to do with ultimate, to trash-talking the other teams using nerdy pop culture language. I also love following the team through the ups and downs of a season, as they take on different teams, have to overcome the challenges of running a little ultimate squad with no school help, to making big comebacks against an enemy school they just love to hate. From tryouts, to learning the game, to awkward romance, to practices, to half-hearted ultimate fist-fights, to match ups, tournaments and more, it all keeps the pages turning and builds towards an exciting conclusion. What messages are you hoping that people take away from your book? First and foremost, I want the book to be something that people just enjoy reading and that they truly feel captures the experience of being an ultimate player. I want them to root for the team, laugh at the hijinks, and genuinely love the story. I also hope they remember what it was like to discover the sport for the first time, and that they also find a new appreciation for the sport and game in its purest sense. That is probably the main message of The Ultimate Outsider: recognize the value of the friendships and fun that the sport can bring. 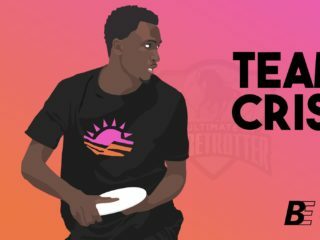 This world of ultimate, which is quickly growing, is truly an amazing community and it really is a unique world we have created. Individually, we choose who we are and what we love, and all of us have chosen in some way shape or form to make ultimate a part of our lives. Remember that and embrace and enjoy it. The Ultimate Outsider is a Skyd Press publication now available on Amazon.